In an interview with Tim Ferris, marketer, Seth Godin says that 97% clients drop out from his online courses. And under good conditions, 80% drop out. Yet there's are three core reasons why clients drop out and unless you tackle those issues, it's impossible to stop the dropout rate from spiralling. At Psychotactics, our dropout rate is a measly 10%. Which means that 90% of the clients finish the course. How is that possible? How come there's such a massive difference? This episode shows you what you can do to achieve far superior goals than many, if not most trainers online. 97% of client drop out in most online courses. 80% of clients drop out from my courses. The responsibility of the learning depends on the teacher. When you think about dropouts, you almost always think about the student. Yet, the responsibility lies with the teacher. It’s this seismic shift that rattles most trainers because in their mind it’s clear that they’ve done the best they could. Despite their best efforts, students still drop out. So why does this dropout occur? And what could you do as a teacher to avoid this dropout? Back when I was about 12, my uncle gave me a Nintendo video game called Snoopy Tennis. The game was pretty simple. Snoopy, the dog, had to bat off the tennis balls being hit at him by Charlie Brown. Charlie Brown had this languid, easy-going serve that was easy to handle. And then Lucy would show up and hit the tennis balls at high speed. If you survived the Lucy barrage, she’d go away, and it would be back to the nice and easy Charlie Brown serves. So what’s Snoopy Tennis got to do with energy management? Energy management involves designing your training module. Does it just have modules that jostle each other for prominence or is it designed like Snoopy Tennis? A training module that has Snoopy Tennis in mind will have modules that are easy, slightly difficult and then screamingly tough. But you can’t sustain the screamingly tough part for too long. You have to go back to easy once again. When the going gets too hard for too long, your clients are going to have an enormous amount of energy depletion. Handling Lucy in that video game is fine for a while, but if the intensity isn’t reduced, the client gets tired. Tiredness, not your course, is the biggest reason for dropouts. Once the fuel needle goes consistently down to zero, dropouts are guaranteed. To avoid this situation from ever occurring, you’ve got to sit down and design your course. Take for example the Article Writing Course that’s in progress right now. The entire course has been designed to be like a Snoopy Tennis game. From Week 1 to Week 4 there’s a gentle progression. Week 5 is a bit of a jolt. After spending the first four weeks building up topics, outlining and working on the start of their article, the writers now have to turn out a chunky part of the complete article. The writers are frozen because the jump is so great. And yet there are times when you can’t help but bring on Lucy into the game. In the past, I’d make sure Lucy stayed on for a long time, and it would cause an enormous amount of exhaustion. Exhaustion is one thing, but I noticed that if I reduced the intensity shortly after, the work would get better. So once the intensity is turned on, you keep it on, but then you get Charlie back into the mix. Which means that one week will involve writing 3-4 articles, but the following week will slide down to just two. It applies to workshops as well. If you get to a Psychotactics workshop, you’ll find we have lots of breaks. There are a ton of tea breaks, group breaks, walking assignment breaks. All of them are designed to lower the Lucy factor and let the brain absorb what it’s just learned. We also have a scavenger hunt and depending on the type of workshop, we may have a day-long break. For instance, for the New Zealand workshop in Queenstown, we have a four-day workshop, but we work for two days, then go off to eat, drink and be merry. It’s only then that we return to our work. Why bother with breaks when you have so much content to cover? It’s because of how your brain functions. As you spend time thinking and learning, your brain starts to accumulate a ton of waste product. The more waste product you have, the harder it is to function. You’re now in Lucy mode all the time. But the moment you get a break, the brain is back in Charlie mode and absorbing the information. It’s a lack of course design. A lack of the trainer to watch what’s happening and to mindlessly plough ahead. When trainers blame the student, they’re going against the Michel Thomas principle: The responsibility of the learning depends on the teacher. And energy management is just one of the issues. The second issue is the safe zone—or rather the lack of it. P.S. We have about 2-3 clients drop out from every course. To me, that’s high. That’s a whole 10-12%. I take responsibility for that. Ask a seven-year-old to learn Photoshop, and they’ll happily play along. Ask an adult to do the same and they hesitate. So what’s changed between the adult and the seven-year-old? The answer is time. A seven-year-old has little or responsibility and therefore endless time. If they get the instructions wrong, they can keep at the learning until they get it right—if they get it right. Adults don’t have such luxury at their disposal. As we grow up, we realise that mistakes not only rattle us but cost us an enormous amount of time and energy. Having to learn new skills seem essential, but all of it is at the expense of precious time and energy. Which causes every zone we enter, to theoretically, become an unsafe zone. Learn a new software; that’s unsafe too. Any new venture of any kind is paradoxically exciting and frustrating at the same time. The first step towards safety is understanding that everything is intimidating—especially when you’re learning a skill. If you’re just a passive learner in a course, there’s no need to apply anything you’ve learned. The moment you have to apply the skill, intimidation is all pervasive. And the only way—yes the only way—to reduce intimidation is to break down everything into smaller bits. Even in a seemingly fun-filled course like cartooning (that’s the DaVinci cartooning course), you have almost instant intimidation. There’s nothing to look over and learn, but there are intimidation factors aplenty. Instead, a student gets to know their groups, is guided on how to post in the forum and is given instructions on how to link their cartoons to the forum. The entire week is about settling in and getting comfortable. Then, once the course begins, no one goes about drawing Donald Duck. Instead, you have a series of tiny increments that start with drawing circly circles. Think of how you feel when you draw something. You feel like you’re a seven-year-old again. Your artwork seems almost Neanderthal—and yet the goal is to become a highly accomplished cartoonist by the end of the course. And hundreds of students have done just that. They’ve done the course, and gone from Cave painting to polished artworks. A lot of this progress is achieved through precise instructions, but the biggest factor of all is the creation of the safe zone. 1) Is the course being conducted with tiny increments or big jumps? How do you know? 2) Do the clients have time to settle in before the class as well as during the course? 3) Is there a constant feedback mechanism in place? Do clients come back to do another course, another training? At Psychotactics, most—yes, most—end up doing two and three courses. Some do as many as five online courses as well as attend live workshops. At the point of writing this article, we’ve announced a live workshop in New Zealand. With no sales page, no real details about the course, six clients have already paid for the workshop. Why would they make such a seemingly irrational move? Why sign up for workshops with no sales pages, attend so many back to back workshops, do so many online courses? There are many cheaper courses both online and offline. So, why bother? Unless a client feels safe, they’re unlikely to learn. And your job as a trainer is to create that safe zone through tiny increments, through getting clients to settle in and most importantly to allow them to reach out to you. When they reach out to you through a feedback mechanism, and you make changes, they know they’re being listened to. They know they’re not just a cog in the wheel, but an integral part of the course. Now there’s less of a reason to drop out, isn't there? So what keeps the client coming back? The answer lies in the power of the group and how you as a trainer filter the group. What’s this filtration all about? Back in 2010, we conducted a workshop around Washington D.C and we did something we’d never done before. We decided not to have any filters when letting clients sign up for the event. How wrong could things go, we thought to ourselves? Only one person at the event hadn’t read The Brain Audit. That one person happened to cause an enormous amount of confusion, not only during the workshop proceedings but also in the group. And it was all because we didn’t do our usually “pedantic” system of filtration. When you don't filter the group, you create a wild card, and that can disrupt the entire learning experience. When you put specific barriers in place, the group members have to qualify themselves to be part of the group. This changes the parameters considerably. In most of the courses and workshops at Psychotactics, all you have to do is read The Brain Audit. Even so, it’s a barrier and attracts people who are united in purpose. It seems bizarre that just a book should make such a difference, but a book often expresses more than just information. It can express your philosophy, method and attracts clients who have a similar ethical standard. – Those who we know well vs. those we don’t know as well. Groups only work together if they feel safe, enjoy each other’s company and then it seems like a party, rather than intense work. In such a case, dropout rates plunge. Clients show up every day, several times a day, helping and spurring each other on. At the end of Week 5, a group of 25 clients generated an average of 1200 posts a week. Of course, I’ve contributed to at least half of those posts, but even so, it’s quite an achievement in group dynamics, don’t you think? The group size is ideally between 5-7 members. If you have fewer and just a couple of clients from that group dropout, the entire group can go into a spiral. If you have more than 7, it’s hard to keep up with what everyone’s up to, and the group soon loses the tight-knit feeling. That feeling of knowing each other well is what causes the group to edge forward together as they take on the tiny increments. And when faced with a tough assignment, they all hunker down and boost each other’s spirits. Leaders emerge within every group, as is the case anywhere, but these leaders are kind and helpful. Why would you want to drop out of such a group? Your goal isn’t to be part of the group. You don’t even know how the group is put together, and yet when you discover the group dynamic working for you, you realise that it’s the group that will get you to your destination. When someone has helped you, your human nature kicks in and you want to give that help back in any way possible. Your job is to design the group. And most of all, it’s to get the group to know each other very, very well. The more they interact with each other, the more they bond and the further they’ll go. Not surprisingly, the drop out almost ceases to exist. But if you look closely at the those that dropout, you’ll see a very clear pattern. They didn’t stay around long enough to bond with the group. In our courses, at least, the maximum number of dropouts (online) occur within the first or second week. If the members haven’t show up consistently within the first two weeks, they’re the most likely to drop out. Which is why, as a trainer, working on the group is almost as important as energy management and creating the safe zone. These three elements become so vital that to ignore any one of these three is like begging for trouble. – Design your training with energy in mind. 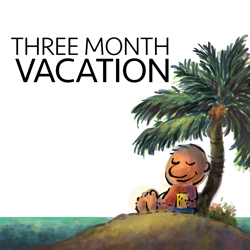 Let clients have a mix of Charlie Brown weeks before giving them Lucy weeks. And always go back to Charlie Brown. – The safe zone is critical to avoiding dropouts. Tiny increments, feedback loops, getting client to settle in are all very crucial. You know you’ve created a safe zone when you get lots and lots of questions; when clients e-mail you as well as ask questions on the forum; when they bring up issues that might be even slightly confrontational. That’s when you realise you’ve created a safe space. Your final benchmark is the repeat client. If they come back repeatedly, that is the one factor that tells you you’ve made them a lot safer than your competition. – Finally, it’s the group that matters. A teacher can only do so much. The group feels a great warmth towards their members, but only if the members are equally kind and helpful. If you notice a group member not interacting with the group, there’s a very high chance of that member dropping out. And you, as the teacher have to design and filter the group so that they’re a good mix. It’s as high as 97% in some cases. But Michel Thomas (if he were alive) would say something quite different. He’d say: The responsibility of the learning is with the teacher. When you take the responsibility on yourself, you stop blaming the student and redesign your teaching in a way that suits them, not yourself. And that’s when you have almost no drop out rate!